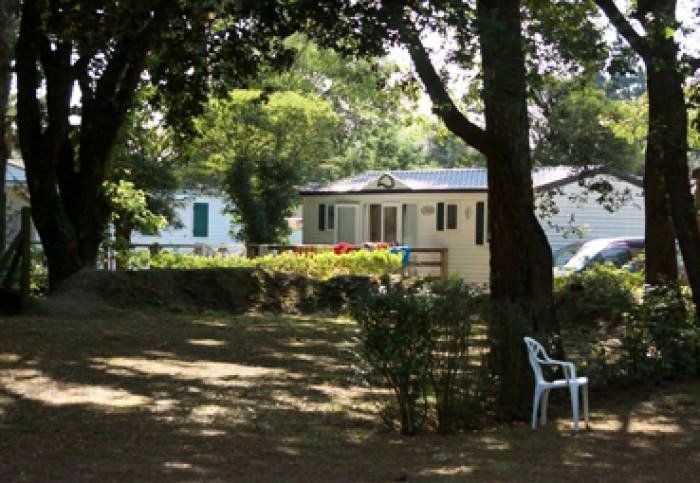 Located 4 km from the beaches, in a pine forest of 10 ha, this beautiful 5 * campsite offers an exceptional setting. Relax in its heated pools, including a covered and paddling pool, water slide, many services and various activities in July and August for children and adults (mini golf, tennis, children's club, daytime entertainment and in the evening, disco ...) will make the happiness of the whole family! A wonderful holiday with family or friends is available to you! The TV can not be rented on site or brought by you. Shops are open during Easter holidays, bank holiday weekends and in July / August. On site you will enjoy the indoor heated swimming pool and an unheated outdoor swimming pool which open from 11/04 to 12/09. The arrival is at 15:00. In case of late arrival, contact the campsite at the number indicated in your travel documents. In low season, the reception opens from 09:00 to 12:30 and from 14:00 to 18:00, in high season from 09:00 to 20:00. The tourist tax is 0. 61 euros per night and per person over 13 years. Le Gois: Between island and continent, Le Gois is a submersible road that can be borrowed at low tide and only for an hour and a half before and one hour after the tide. Located in Bourgneuf Bay, the Gois connects the island of Noirmoutier to the mainland. The Gois de Noirmoutier has the peculiarity of measuring more than 4.5 kilometers long. Ecomuseum of the Vendée Btreton Marsh: Within an area of ​​60 hectares, the ecomuseum of the Marais breton-Vendée of La Barre-de-Monts, Le Daviaud, traces the history of the marsh. You will discover, in addition to the natural site, a salt marsh restored to working order and a farm reconstituting local daily life in the early twentieth century. Change of scenery guaranteed! The rail bike: With family or friends, travel the 10 kilometers of railway linking Commequiers to Coëx. You will discover the hinterland of Saint Gilles Cross of Life, cross the old station of Saint Maixent on Life and cross the river "Life". A11: Paris, Le Mans, Angers, Nantes to Bordeaux-Saint Philbert de Grand Lieu Machecoul and then Challans, Saint Hilaire de Riez. At the roundabout located at a place called The Pissot follow Saint Hilaire de Riez. At 2 km, at the roundabout, turn right on Saint Hilaire de Riez center.